Dye-sensitized solar cells have received considerable attention since the advent of mesoporous TiO2 thin films described by Grätzel and O’Regan . 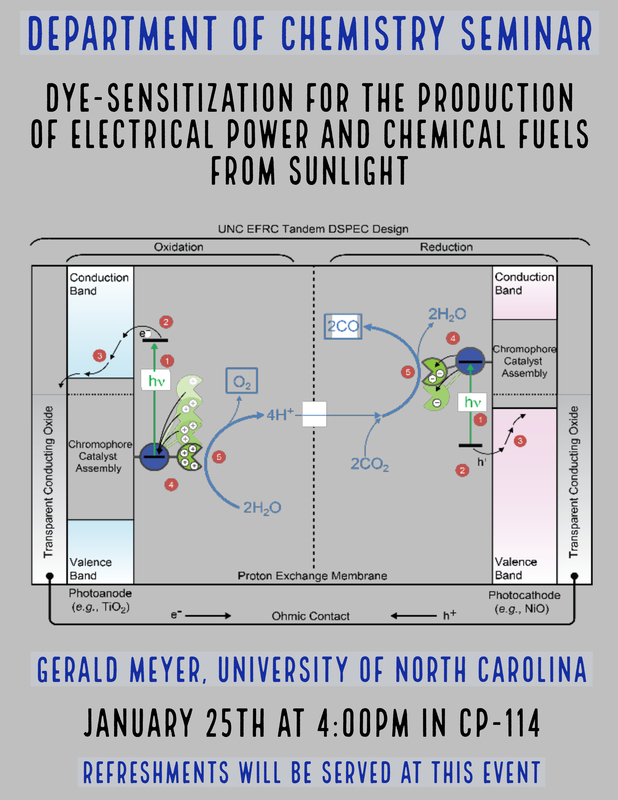 The UNC-Energy Frontier Research Center (EFRC) is interested in these materials for the application in dye-sensitized photoelectrosynthesis cells (DSPECs) that produce fuels that can be used when the sun has set . Recently a kinetic pathway for an unwanted charge recombination reaction between the electrons injected into TiO2 and an oxidized dye was identified. [2,3] This was accomplished by the rational design of molecules where the distance and driving force were held near parity and only a bridge unit was varied between a xylyl- and a phenyl- thiophene bridge. Spectroscopic analysis revealed that electronic coupling through the phenyl bridge was a factor of ten greater than through the xylyl bridge and this lowered the free energy for electron transfer. [3,4] Dye-sensitization was also utilized to generate a high valent metal oxo species implicated in water oxidation  and I-I bonds in terionic iodide complexes. Background on dye-sensitization and solar energy conversion will be provided that gives context for these most recent advances and suggests new directions for future research and applications. “A Low- Cost, High Efficiency Solar Cell Based on the Dye- Sensitized Colloidal TiO2 Films” O’Regan, B.; Grätzel, M. Nature 1991, 353, 737. “Finding the Way to Solar Fuels with Dye Sensitized Photoelectrosynthesis Cells” Brennaman, M.K. ; Gish, M.K. ; Alibabaei, L.; Dares, C.J. ; Dillon, R.J.; Ashford, D.L. ; House, R.L. ; Meyer, G.J. ; Papanikolas, J.M. ; Meyer, T.J. J. Am. Chem. Soc. 2016, 138, 13085-13102. “A Kinetic Pathway for Interfacial Electron Transfer from a Semiconductor to a Molecule” Hu. K.; Blair, A.D.; Piechota, E.J. ; Schauer, P.A. ; Sampaio, R.N. ; Parlane, F.; Meyer, G.J. ; Berlinguette, C.P. Nature Chem. 2016, 8, 853-859. “Kinetics Teach That Equilibrium Constants Shift Toward Unity with Increased Electronic Coupling” Sampaio, R.N. ; Piechota, E.J. ; Troian-Gautier, L.; Maurer, A.B. ; Berlinguette, C.P., Meyer, G.J. Proc. Nat. Acad. Sci. USA 2018, 115, 7248-7253. “A High Valent Metal Oxo Species Produced by Photoinduced One Electron, Two Proton Transfer Reactivity” Hu, K.; Sampaio, R.N. ; Tamaki, Y.; Marquard, S.; Meyer, T.J.; Meyer, G.J. Inorg. Chem. 2018, 57, 486-494. “A Ter-Ionic Complex that Forms a Bond Upon Visible Light Absorption” Wehlin, S.A.M. ; Troian-Gautier, L.; Sampaio, R.N. ; Marcélis, L.; Meyer, G.J. J. Am. Chem. Soc. 2018, 140, 7799–7802.